A smart robot tyre inflator you plug it into your cigarette lighter, set the pressure you want, it then pumps your tyre to that pressure and switches off. Stored inside the air compressor is a 12 foot lead, unwind and plug into your cigarette lighter (these are a standard 12 Volt DC and the plug fits all). Clip the air hose onto your tyre valve. A clear digital display will give the pressure. Press the power switch and the tyre pump will start, automatically inflating your tyre, very cleverly stopping slightly above your setting to allow for that pssst when you remove the hose from the valve. Also contains adapters for to fit mattresses, balls, bicycle tyres and more. So a robot tyre inflator with pressure gauge that switches off at the correct pressure has a powerful enough motor to handle truck tyres and more but has the gentleness of a bicycle pump when required. 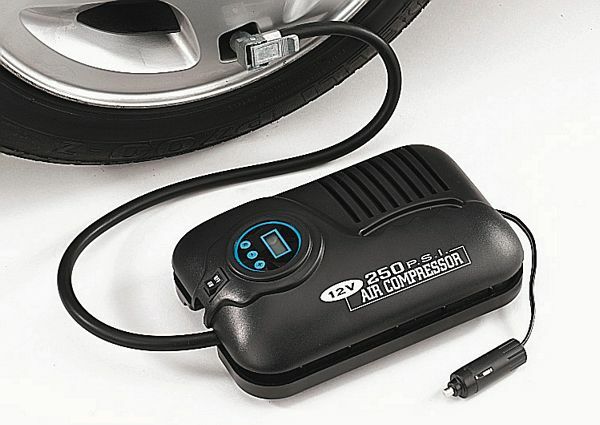 Mini Foot Pump Tyre Inflator. Tyre Inflator Digital text, images and video are copyright.